One day, there will come a time you are unable to continue to work. Before that happens, it is wise to plan beforehand how you are going to get the money in order to do that. How much money will you have to save? Using the free template that the Retirement Savings Calculator Microsoft Office offers is a good option because of this price. The template can be personally customized to your situation. It also is straightforward and easy to use. This special template lets you relax when it comes to calculating all those tedious numbers and figures. 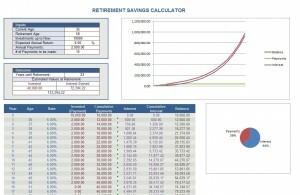 Basically, all the work is done for you on the Retirement Savings Calculator template. First, simply fill in the data and save the file. Play with the customizable data if you want to before doing this. Make sure that your figures and numbers that you put in are accurate. Second, take a look at the results in your output box once you have the new document with all the data customized. This is the left-hand box located on the top of the Retirement Savings Calculator Template Word Document. Make sure that you are not just putting in random numbers in order to fill out the document, or your results might be wrong. Make sure that you follow through on your plans that you put in the document. After all, what is the point in using the template if you are not going to follow through and use it to your advantage? You may need to address changes in your retirement savings plans. That is perfectly fine too. All that needs to be done is for you to put the accurate amounts of saved cash into the squares that ask for them. Those are the squares at the very bottom of the template. Press enter when you have done that and watch the numbers add up by themselves for you right before your eyes.